What does having it all look like? Being able to order a perfectly ripe peach from room service in the middle of the night? Buying a helicopter? Or running up a colossal ‘flowers and miscellaneous’ bill (miscellaneous being items of the recreational euphoria variety)? 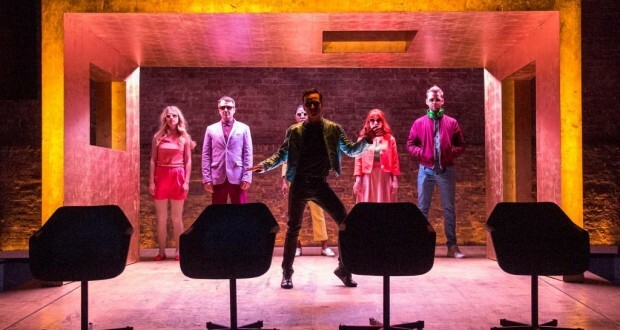 Andrew Scott’s Paul is at the height of his fame and the depths of his personal ennui in Birdland, as he embarks on the final week of a world tour, playing to thousands and existing to none, least of all himself. This could be a tired and staid topic; absolute power corrupts absolutely etc, but in shying away from a straightforward redemptive journey arc and in exploring the complexities and contradictions of the personality of modern fame, Stephens has covered some interesting territory, upheld by the stellar casting of Andrew Scott. The play’s dedication is interesting – stating that its spirit was “charged by the spirit of the Patti Smith song of the same name” – a song about the grief and disbelief of losing a parent. Certainly the heart of the piece relates to Paul’s loss of himself, but there is a touchingly faltering encounter with his father which provides one of the few emotional flashpoints of the play. Paul’s evident bafflement at any problem he cannot fix and any person he cannot love with money (“everything can be quantified”) resonates with his crippling emotional disconnect from his family, home and the focus of who he was before his ascent to stardom and therefore is now. Scott is of course magnetic – it’s difficult to draw your gaze away from his mercurial presence and, whether intentional or not, the rest of the cast are rendered impossibly secondary aside from best friend and bandmate; Alex Price’s loyal and jocular Johnny. Much like his onstage persona, Scott plays the audience like an instrument, in an enjoyably knowing halfway house between character and reality. The audience is in fact used several times as an acknowledgement of Paul’s realisation that everyone is watching him all of the time – his relationship with which alternates from comfortable expectation to fear and paranoia and back again, reminiscent not only of a superstar’s relationship with their audience and fans, but also the media. There is much to fear in a post-Diana, post-News of the World arena. Ann Yee’s movement has Scott jerking around in a parody of dance moves, like a puppet on a string, underscoring his role as a controlled commodity. Paul’s childlike understanding of the world and way of forming connections with other people, built on a belief that the record company (the invisible parent) will take care of everything, is tangibly pitiable as he experiences almost the polar opposite of normal human interaction – succeeding effortlessly at getting women into bed but utterly failing to maintain relationships thereafter. Led as he is by his own every whim, there is no method and no measure to his behaviour – one moment he wants to plunge his hands into bucket of caviar, the next simply for a hotel worker to tell him about her day. His own awareness of himself as a product, an experience, is at times quite chilling – “Is it a little bit exciting? Kissing me.” It’s difficult to get to the heart of who Paul is or might have been. This is likely the point as his sense of self has been so utterly obfuscated by his lifestyle and hangers on, but in reading the text it is interesting to note how it has been shaped and changed in rehearsal, at the loss of some more personal moments and it is worth wondering whether this staging could have been carried off without its current lead. Despite this soullessness there is an erstwhile intelligence to Scott’s portrayal and beneath the fits of coquettish boredom and outright malice bleeds a sense of someone trapped in a Sisyphean cycle of samey hotels, repetitive interviews and encounters with an exhaustingly sycophantic, utterly disinterested public that no one could be expected to sustain without losing their grip. Birdland serves as a reminder that, incongruous with Patti Smith’s lyrics, the famous are “completely human”.